During a four-day stretch of concerts in November of 1965 at the revered Cafe Au Go Go, a band of New York-based blues musicians recorded its first album. The club, which was the first New York venue for the Grateful Dead, also featured an often weekly collection of uber-talented blues artists entitled the Blues Project. I mention the Dead because the Blues Project was known as the New York response to the Grateful Dead, which was also a collection of incredibly talented blues musicians. Unfortunately, the Blues Project lacked the staying power and fell into 60s music history – although two members did form Blood Sweat & Tears. I bring the band back today on the Music Court because the debut live collection of covers is a sparkling example of true 60s blues music that engendered the propagation of the genre stateside. 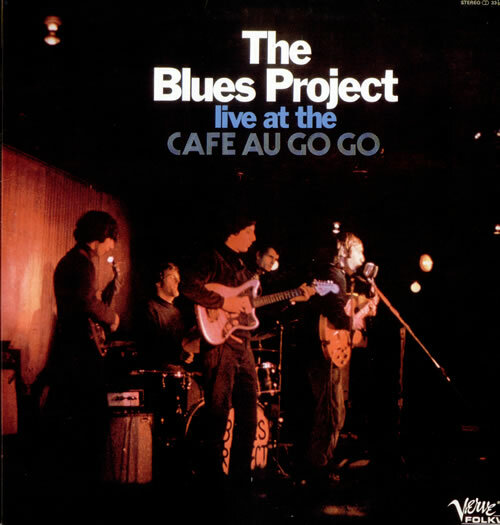 The Blues Project was a jam band at its finest. The album was actually a cut version of several longer covers of famous blues songs like “Back Door Man” and “Goin’ Down Louisiana.” These covers were fresh and inspirational, as several British blues musicians would also come to cover these songs with similar aptitude. The big three members of the Blues Project were guitarists Danny Kalb (also vocals) and Steve Katz and organist Al Kooper. Tommy Flanders kicked in some vocals, and the band also included Andy Kulberg on bass and Roy Blumenfeld on drums. Al Kooper actually joined the group after its failed audition for Columbia Records; Kooper was a session musician and liked what he heard. It didn’t take long for the band to secure a record deal with Verve Records and record its first album. So, let’s talk a bit about Live at the Cafe Au Go Go. One of the interesting components of the album is that it blends classic 60s folk with pre-60s blues. For example, The Blues Project performs a version of “Violets of Dawn,” a piece by Greenwich Village folk staple Eric Andersen. Just a killer version of this classic. It moves with vigor: effortless percussion, whining blues guitar, efficient bass, and fitting vocals. It is gritty and more true to real rock n’ roll blues. It also demonstrates The Blues Project’s ability to successfully swap between folk and rocking blues with ease. A truly talented band that deserved more listerners and success.